(Poland and the Free State Krakow, The Russian Kingdom.) With title and signs + symbols cartouche as well as twofold miles indicator for geographic miles + Russian werst. Map by Friedrich Wilhelm Streit (Ronneburg, Thuringia, 1772 – Berlin 1839). Steel engraving partially colored in outline for Natorff & Comp. in Berlin. 1836. 11½ × 9 in (29.1 × 22.7 cm). Center: Warsaw. – Free state Krakow situated at the map’s lower edge. 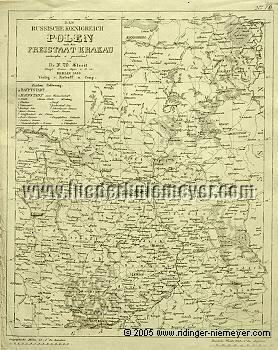 – Otherwise till Troppau – Oppeln – Wartenberg – Bromberg – Königsberg – north of Gumbinnen up to River Memel – area of Kaunas – Njemen – Grodno – Bialystok – south-easterly up to River Bug . – The left lateral margin especially in the lower half age-marked and with dog’s ear still concerning the map’s lining/geographical miles indicator and, just as a small tear in the white margin upper right, backed acid-freely.